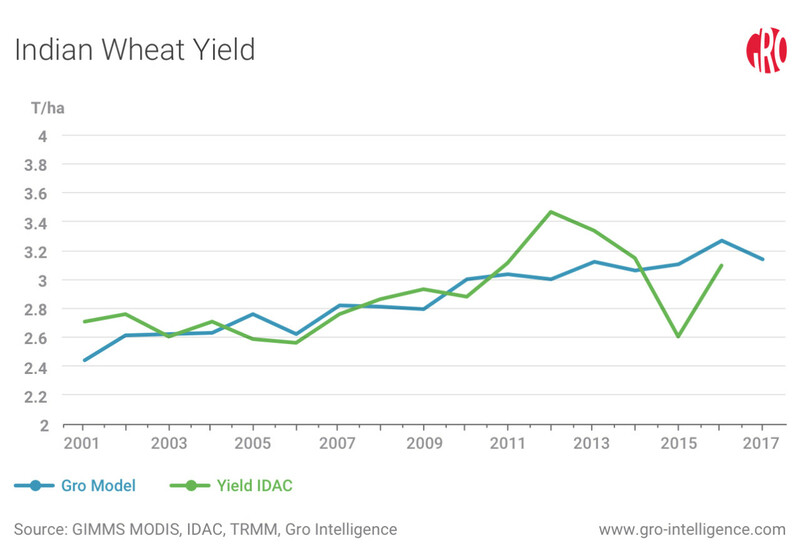 Gro India Winter Wheat Yield Model backtest results as of May versus Indian government final yield estimate. India has the second-largest population in the world and is expected to rank No. 1 by 2024. As the Indian people become more numerous, they are also becoming more prosperous. Consumers with incomes that increase from low levels tend to want more wheat in their diets. The net effect has been a rapid increase in Indian wheat demand. 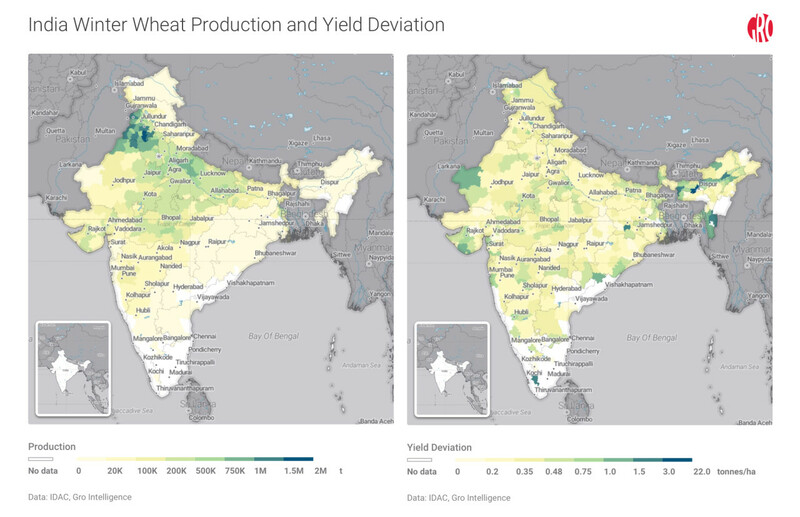 Because of the increasing importance of India’s agricultural sector, Gro Intelligence a year ago decided to build a machine-learning-based yield model for India’s winter wheat crop. 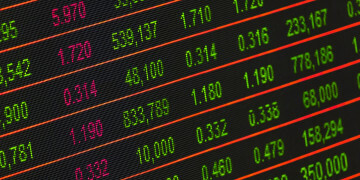 It follows the process set forward in our successful US corn and Argentine soybean yield models. 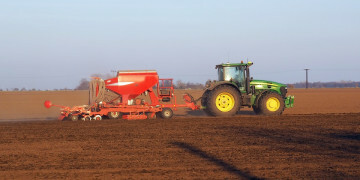 The India wheat model began generating forecasts in January 2019 for the crop that will be harvested in March and April. Gro subscribers can sign up to get daily emailed updates and will benefit from advance knowledge of the crop’s status. A challenge in building the India wheat model was a lack of good, objective acreage data of where the wheat grows. This information is needed to construct a crop distribution map, or mask, in order to use our satellite data to estimate the crop’s health and size. We faced a similar problem in creating our earlier Argentine soybean model and solved it by estimating the crop’s distribution using the timing of its planting and growth. Given that knowledge, dated satellite greenness data indicates which crop is planted where. The next step was to test various environmental metrics at the district, or county, level to see which ones best “predicted” the known final crop yields as we backtested previous crop years. Normalized difference vegetation index (NDVI) and evapotranspiration (ET) anomalies provided the best insights, so those became the main predictors in the final model. The model also includes soil type and moisture data from multiple depth levels. The India wheat model results meet our criteria for reliably forecasting yields. 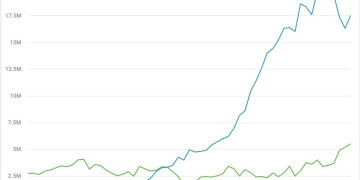 Backtesting shows that as the season progresses, the model’s output converges to arrive at the actual result. This is as it should be, given the increasing amount of information available from the satellite photos. What’s more, similar to what we saw in our earlier yield models, Gro’s machine-learning algorithm achieves higher levels of accuracy in regions that are most important to wheat production. According to various statistical measures (details here), the India wheat yield model allows users to anticipate the official results. India winter wheat production concentration by district (left). India final yield versus Gro yield model estimates (right). Gro’s model performs best in India’s major winter wheat-producing districts.